1) Wash the pork and make 4 -5 large pieces. Put in a pressure cooker, add 2 cups of water and cook for 15 mins. The Pork should be tender and not over cooked. When the meat cools down, cut into desired size cubes. 2) First dry roast the coriander (dhania) seeds and then roast the fennel (sauf) seeds in a pan for 6-10 mins on medium heat. The two should not be roasted together as they do not roast uniformly. 2) Add the Panch Phoran (five spice mix) to the oil and when it starts crackling, add the boiled pork pieces and cook in the Oil for 5 mins. Mix Turmeric and salt and cook for another 5-8 mins. 3) Once the pork pieces are slightly fried, gradually add the dry spices mix (coriander, fennel, chilli,dry mango powder/lapsi powder) to the pork and keep stirring. Keep the fire on very low flame and cook for a just about a min . The Masalas should be properly coated on all the pork pieces. 4) Add vinegar and Mix. Adjust chilli and vinegar according to your taste. 5) Let the pickle cool down and then store in air tight container and put it in the refrigerator. The pickle can last for upto 3 months. The Vinegar and Oil help to preserve it . 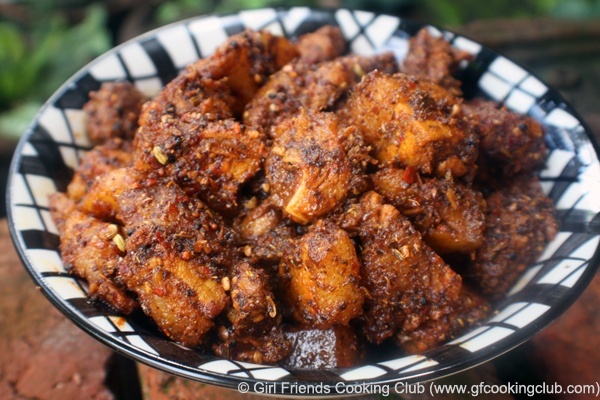 This entry was posted in All Recipes, Grand Ma's Recipes, Nepali Food Recipes, Pickles & Chutneys, Pork and tagged Nepali Cuisine, Nepali Recipes, Pork Pickle by Kamakshi. Bookmark the permalink. Looking at the picture and the ingredients used in the recipe, shall try it right now and am sure it would come more than the expectations. What kind of pork meat is best to use for this recipe? With bone, boneless, with fat and skin, or only meat? I really want to try this out! Geeta , you can use either pork meat with bone or boneless. Depends on which you prefer. However, the meat should have a combination of red meat, fat and skin … to get the best taste …. Happy Cooking ! Thanks. I made it with boneless pork with fat and meat but no skin. It turned out really tasty! My husband liked it so much. I still have it in the refrigerator in air tight container and we eat it like appetizer sometimes. Goes very well with wine or beer. Good snack for Dashain too. Very good recipe. Easy to make. Well done.